I really, really liked Bridesmaids. Who wouldn’t? There’s practically nothing to dislike! It features 1) probably the most number of funny women ever on screen at the same time (two of whom are SNL hall-of-famers), 2) a rich, emotionally resonant story about friendship and self-worth and 3) an Irish cop, drinking. But there’s a weird sort of bipolarity lurking beneath the film’s surface, vacillating for two hours between the “female Hangover” proclamations of the marketing campaign (at right: “these ladies just don’t give a fuuuuu–“) and a quieter, maybe even melancholy story buried under scenes of women shitting in sinks. Not that those two tastes (??) can’t coexist — producer Judd Apatow has built an entire career on their combination — but that in Bridesmaids, it never feels all that harmonious. There’s the movie this was sold as (and pushed toward)…and the movie it seems afraid to be. …it’s difficult to discern which are sincere, and which just desperately, desperately want their words to be true. I’m obviously in no position to say “Dana Stevens, you’re LYING!” but at the same time you can’t read some of the more common articles of praise without feeling they’re…missing something. Don’t worry — the myth-busting team at Lifting Fog is ON THE CASE. FACT: Not untrue! Just add “…but exists almost in her own movie, ultimately distracting to a story that seems to want to be much smaller than it actually is.” It’s no huge leap to say that McCarthy is to Bridesmaids as Zach Galifiniakis is to The Hangover, but that doesn’t change the fact that she’s less a character than an ongoing joke (even if, to the writers’ credit, we’re not laughing at her). FACT: She’s not playing the Target Lady or Gilly, which I guess is a plus, but to call her a “dynamic actor” when she’s mostly just frowning for the duration of the movie reads like wishful thinking. Let’s be clear: Kristen Wiig is INCREDIBLY talented and one of the best-ever SNL cast members. But what Bridesmaids demonstrates is what most people have long suspected, namely that she has two speeds — comatose and insane — without much maneuverability in-between. FACT: “…that is, the ones who are given character arcs and screen time.” Poor Ellie Kemper and Wendi McLendon-Covey get almost nothing to do, which is a shame for two very funny actors. Their characters essentially disappear from the story halfway through, with no payoff to their subplot. …Or maybe it is? I saw Bridesmaids with a person of my opposite gender who reacted to it much the same way I did, but I’ve also heard from women who used the words “important” and “totally true to life” to describe the movie (which again features a scene where Melissa McCarthy shits in a sink). Ladies, help me out — as a guy, am I just incapable of really getting Bridesmaids? Is this movie the Second Coming? Hamm cannot be a part of your answer. While the womenfolk knit me a response, let’s talk about some of the things Bridesmaids does well. Quite a bit, actually! For one, Rose Byrne is a luminous angel who should be in all the movies Across the board, there’s not one ounce of acting dead weight. Everyone from the bridesmaids to the Irish cop to the weird roommates is at least funny. And however disjointed all Apatow comedies tend to be, the improv scenes always land. Bridesmaids — with its “who’s who” of awesome female comics — is no exception. When the characters are allowed to just talk, you will laugh. It’s in those scenes, too, that you begin to realize Bridesmaids isn’t so much the “female Hangover“…but rather the female I Love You, Man. Despite the poster ladies’ protests to the contrary, there’s very little about the movie that could be considered totally ridiculous. I mean, yes — you’ve got food poisoning at a dress shop and drunken outbursts on a plane and mental breakdowns at a bridal shower. (There are more than a few “somethings at a something.”) But underneath all that wackiness is a surprisingly sweet, nuanced look at female friendship. Remember how at ease everything about I Love You, Man felt? The extent to which you were just happy to watch Jason Segel and Paul Rudd enjoy each other’s company? When Bridesmaids slows down for a second and gives Kristen Wiig and Maya Rudolph real scenes to play, they’re FANTASTIC — conveying an old but evolving friendship with total ease and authenticity, and never sacrificing laughs in the process. Compare with Melissa McCarthy stealing a bunch of puppies (?) and ask yourself: why couldn’t we see more of that FIRST kind of movie? Deleted scene from the SECOND kind of movie. 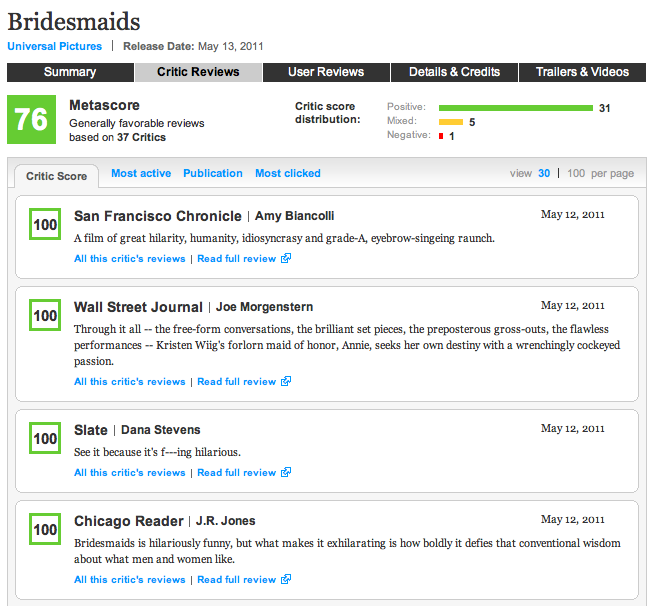 …Or to paraphrase all of the above, I liked but didn’t love Bridesmaids. B+! Shocking though it may be to hear, I’m a dyed-in-the-wool contrarian who liked-then-hated both Napoleon Dynamite and Garden State and will never be able to bring myself to admit that Watchmen was probably not that good. So take my critical evaluation with a lot of salt (and some tequila and a lime wedge). Come three years from now when some other notable comedy has me scouring antonyms and beginning my sentences “yes, but,” it’s beyond likely that I will quietly admit that I thought Bridesmaids was great. Until then? I just don’t get you people. This entry was posted on July 5, 2011 at 3:00 am and is filed under Reviews. You can follow any responses to this entry through the RSS 2.0 feed. You can leave a response, or trackback from your own site. This includes allowing users to work virtually anytime, anywhere. being inaccessible from a drive or an off site storage solution. One solution that was bandied around back then: to create a password.